Piñata Farms is among nine Queensland agricultural businesses collaborating with the University of Queensland's School of Agriculture and Food Sciences to provide industry experience to students. 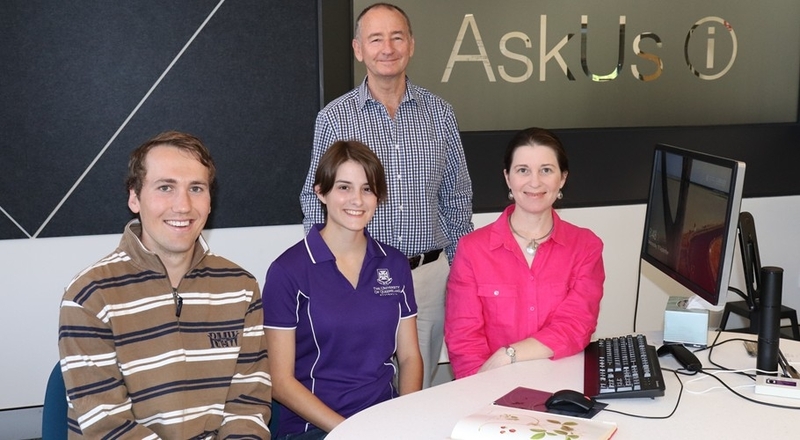 From UQ's School of Agriculture and Food Sciences are from left, students William Hudson and Alice Freemantle, lecturer Dr Phil Currey and tutor Janine Basha. Piñata Farms' chief financial officer, Chris Jones, said four students based at UQ's Gatton campus - Alice Freemantle, William Hudson, Glenn Denham and Yoko Lathouly - were reviewing Piñata's management reporting systems as part of the final component in their Bachelor of Agribusiness degrees. "A collaboration such as this fosters career pathways into agribusiness and helps us identify potential employees. Project outcomes also offer fresh perspectives into how we might improve as a business," Mr Jones said. "We were keen to get some non-financial metrics in place that we can use to benchmark KPIs against. "In this specific project, students, working as a team, were asked to review whether current management reporting systems provide timely and appropriate data and devise ideas on how to improve them. They are looking at measures such as what drives price and quality, what other agribusinesses are doing, what industry is doing and what might be useful benchmarks for Piñata as it continues to grow," he said. The 13-week project began in August, with students to present their report in late October. "Piñata Farms' managing director Gavin Scurr and North Queensland operations manager Stephen Scurr have had a long-standing relationship with UQ's School of Agriculture and Food Sciences. A 2016 graduate, Reannan Schultz, now works fulltime at Piñata Farms after participating in a similar project in her final year. "Gavin and Stephen are immensely proud of what their farming business has achieved. This project is a way to give back to the agribusiness sector and to support the next generation of farming professionals," Mr Jones said. UQ lecturer in agribusiness at the School of Agriculture and Food Sciences, Dr Phil Currey, said all students were studying for a Bachelor of Agribusiness. While some doing dual degrees, the Piñata Farms' project was the final assessment component of the Bachelor of Agribusiness degree, he said. "The purpose is to enable students to put into practice what they've learned in the previous three years. They are referred to a business, they present as consultants and are expected to use their skills to research a problem set by the client and then share their findings and recommendations. "The objective is to create opportunities for students to be employable by applying theory in a real-world environment," Dr Currey said. He said nine south-east Queensland agribusinesses, from a diverse range of sectors including dairy, beef, sugar cane and food manufacturing, were participating in the scheme which involved 33 students. "The course is designed so students can choose to work in areas within agriculture that are of specific interest to them. It's about ensuring UQ provides opportunities for students to gain genuine employment skills while enhancing our reputation as a world-leading agribusiness course provider," Dr Currey said. "How the students perform helps UQ understand how the courses work in practice and which areas of earlier study need to be tweaked to provide better outcomes for them and the clients." "The outcomes are the clients' to execute. Our aim is to give clients the tools and confidence to make changes," Dr Currey said. In a group statement the students said: "This form of work-integrated learning is an invaluable experience for anyone studying agribusiness. Some students, especially those from the city, may not have the opportunity to gain real industry exposure. Working with Piñata Farms has given us the chance to integrate our academic learning with a meaningful practical application. We have developed confidence in our skills as upcoming agribusiness professionals, as well as increased overall employability and experience." According to the 2018 Performance Ranking of Scientific Papers for World Universities, UQ is ranked first in Australia and fifth in the world for Agriculture research.